And while it was not present last night at the dance, (but ’twas nominated in the film category at the Razzies), The Twilight Saga: Breaking Dawn Part 1, (indeed, all the editions thus far), had something happening that totally astonished me. And now, you can have it too! I found the Grooming Kiosk you see above at my local BBuy: hair dryers, hot rollers (Easily creates Rosalie’s voluminous, loose curls in seconds! ), styling irons, etc etc etc! 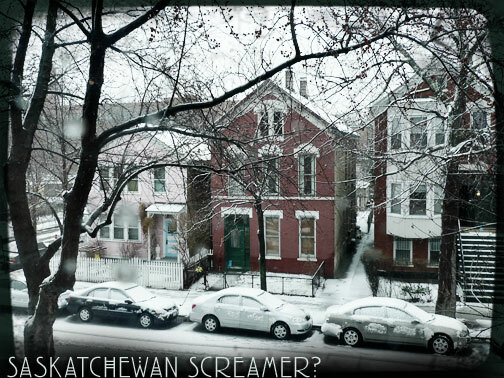 If you are at long/lat: 41º 88′ N, 87º 63′ W today, you might be enjoying something that’s being labelled a Saskatchewan Screamer. No. It is not a ride at Great America. It isn’t even very daunting conditions for We, Heroes of The North (WINTER IS COMING!) who are rather blase about thug weather at any time of the year. To us, it is S.N.O.W. But indeed, it’s a little sloppy, sleety and slippery and it’s still cold (34°) so we are going to hunker down today and get some fierce knitting done! Here at Studio Chic, we draw on the wisdom of the urban forest creatures such as the mighty Squirrel, whose philophy is stuffing something away for a craptastic day. The twin adjuct to this idea is taking the time you’re forced to be indoors as an opportunity to learn something. 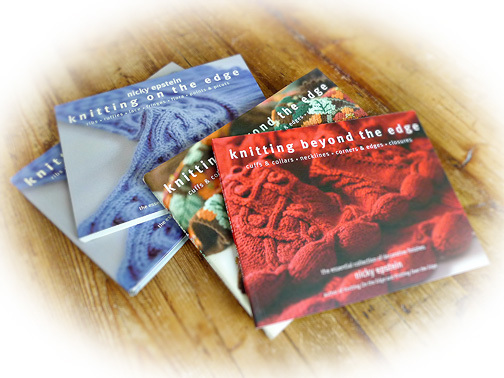 They are from Nicky Epstein (via Soho Publishing) and are an indespensible addition to your creative library: Knitting on the Edge & Knitting Beyond the Edge (in hardback & paperback editions). TGIF Review: In every life some rain must fall and whether its bad weather or a misbehaving pattern, there is nothing like a back-up plan. Solution? Reference Books. b. I’d have never figured out how to do it myself. In the pages: Ribs, ruffles, lace, fringes, flora, points, picots, cuffs, collars necklines, corners, edges & closures. In a word: EMBELISHED with no fuss & no fear! 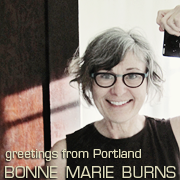 Four folks (1 – book/ 1 – person per draw) will be randomly drawn next TGIF and invited to get busy! 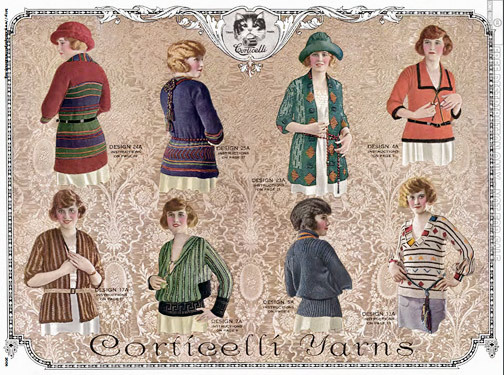 …The winner of the PRINCIPLES OF KNITTING from TGIF February 17, 2012 is Liz M, the 123rd commenter!! Being ever so misty-eyed that Season 2 of Downton Abbey has wrapped here in the States doesn’t mean the story has ended but just a different king of chapter continues. 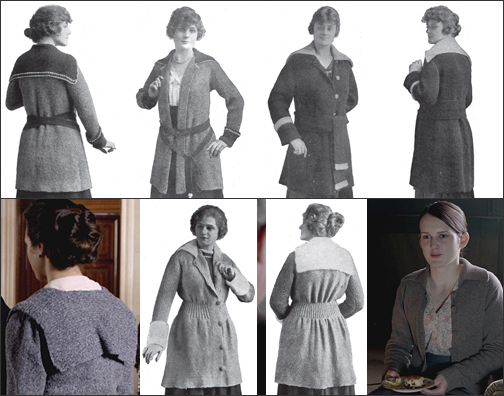 Knitwear from almost 100 years ago. Women were just being more Public. They were going Outdoors more than ever before. They were playing Sports. 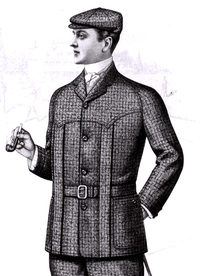 The popularity of tennis & golf gave rise to the need for some mobility garments, stat. And now, sweaters and jackets appeared for women that allowed them the same range of movement that their brother golfers and swingers were enjoying. No more Mutton Sleeves; begone Bustles, farewell hemlines that dragged in the dirt. Hello Norfolk-style sweaters and ankles! Range of Motion. Mobility. Action. And something else happened that was very exciting: fashion equity. 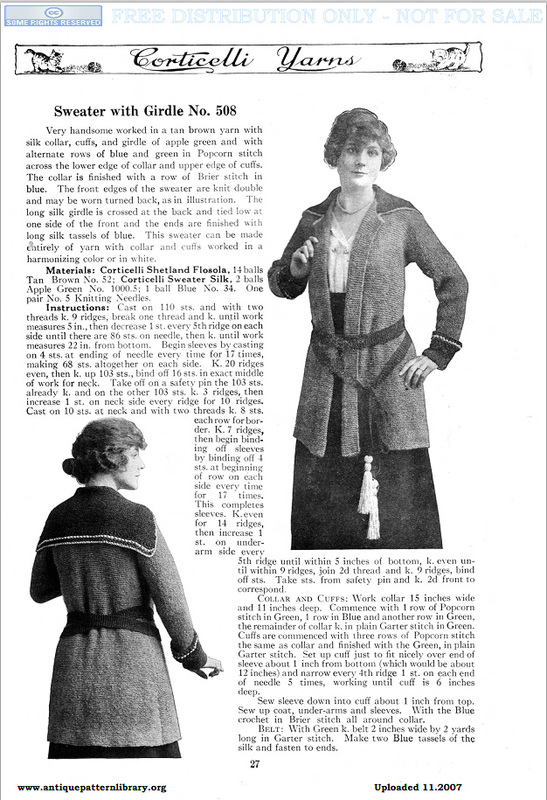 And this is what I find the very most exciting about clothing from this time: women moved away from being rather strictly ornamental to being At Large. Cheers & see you in Season 3?